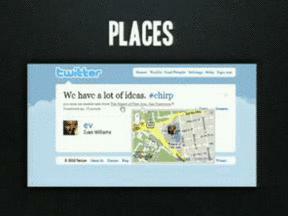 Back at Chirp, Twitter set its coordinates to up the ante on becoming a major player in the location-based social network space. By acquiring Mixer Lab's GeoAPI just before the developer conference, the microblogging platform was prime to start launching local-based services. Twitter Places is one of the first. The major tenet of Twitter Places is to offer users the ability to link geo-tagged tweets to actual places - for example the Capetown Stadium for the World Cup - where people in the stadium could view all the tweets emanating from the venue in their Twitterstream. Since March, Twitter has included tags for more general locations, such as a city or a neighborhood. But Twitter Places lets users be more specific, such as the above example at Soccer City . According to Check-in Mania, neither Denis Crowley of Foursquare, nor Josh Williams of Gowalla seem be Ev Williamsthreatened by this launch. In fact, to the contrary, Evan Williams of Twitter said in April that Twitter would not infringe on the services that location-based social networks like Foursquare and Gowalla were already providing. In fact, Twitter integrated those two services into Twitter Places, so that if users were to click on a particular venue like a bar or restaurant, they would be able to see both Twitter posts and Foursquare and Gowalla check-ins from those locations. All Twitter users have to do to share their location is click on a link that says “add your location” when they write their post. They can choose from a database of places nearby or add their own. While Twitter speeds along in the location-based space, Facebook appears to be somewhat stalled as to what their next move will be. Aside from one major promotion with McDonald's, I think the priority of ironing out their privacy issues has shifted their focus. However, there are published reports that Foursquare is talking to Facebook about a collaboration or acquisition, although Facebook may be hesitant to introduce a location-based feature given the recent controversies over its privacy settings. Get Personal With A Towel Warmer!